The tooth is either a Mastodon or Gomphotherium Crown. Bit hard to tell which because of the damage. More than likely a Mastodon crown. Close, but what you have there is a mastodon tooth, a close relative to mammoth. Mastodon were must more common in central North America. They are very easily distinguishable by their teeth, you see a mammoth tooth looks like the tread of a sneaker more or less, flat with shallow ridges. 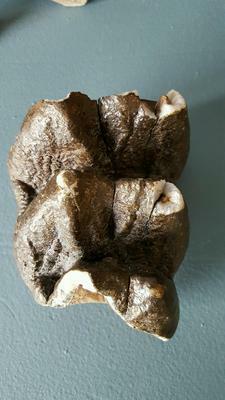 Mastodon teeth however have grand cusps on their teeth that look like a mountain range. This one looks a little more like a mommoth tooth but according to the geologic maps of the area around Lake Michigan there should be no mammoth remains there. The rocks around Lake Michigan are all Paleozoic age. So no mammals. I can't tell you what this is but let me show it around to some folks that are more knowledgable about that area. If I find out anything I will post it here and send you a notice.